A retaining wall is designed to hold back filling soil or to support excavation work. You may need a Planning Permit, Building Permit or both to build a retaining wall. To help you work out which permits you need, begin at Step 1 and answer the questions one at a time. You may be asked to look at property zoning, measure the wall, and assess the wall's position in relation to property boundaries. Will you be building a retaining wall in a Heritage Overlay? Are you building a retaining wall in one or more of the overlays listed in this step? See whether the property is in a Commercial 1 Zone or Commercial 2 Zone. Is the property within a Commercial 1 Zone or Commercial 2 Zone? Is the property in a General Residential, Neighbourhood Residential, Mixed Use or Residential Growth Zone? If no, look at requirements for non-residential zones. As a property owner in a General Residential, Neighbourhood Residential, Mixed Use or Residential Growth Zone, consider whether the retaining wall will be used for a non-residential function. For example, will it be used as part of a medical centre? If the retaining wall is for residential purposes, you won't need to apply for a Planning Permit. If the wall is for non-residential purposes, email Statutory Planning to discuss any specific planning requirements and exemptions for your circumstances. Did Statutory Planning advise that you need a Planning Permit to use a retaining wall for a non-residential purpose ? Aside from Commercial 1 and 2 Zones and the residential and mixed use zones, the property may fall into a number of other zones. Refer to the report from Planning Maps Online to see which non-residential zone affects your property. Then email Statutory Planning to discuss the specific planning requirements and exemptions for that zone. Did Statutory Planning advise that you need a Planning Permit for your non-residential zone? Provide a design response or explanation of the proposed use. A design response is a plan that depicts how the proposed design responds to its context. It supports the proposal by showing how the design works within the site's constraints. If the project requires that you demolish an existing retaining wall, you nay also need to apply for a Planning Permit for demolition. 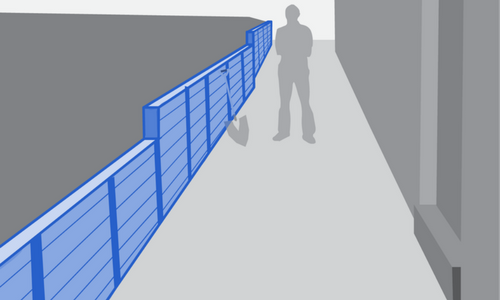 Measure the distance from the top of the retaining wall to its lowest point. Is the height 1m or more? Retaining walls that support excavation have different constraints to walls that support a filling. Does the wall support excavation? If no, you do not need a Building Permit. As long as there are no planning restrictions, you can proceed to construct a wall that supports a filling. You may now exit this guide. 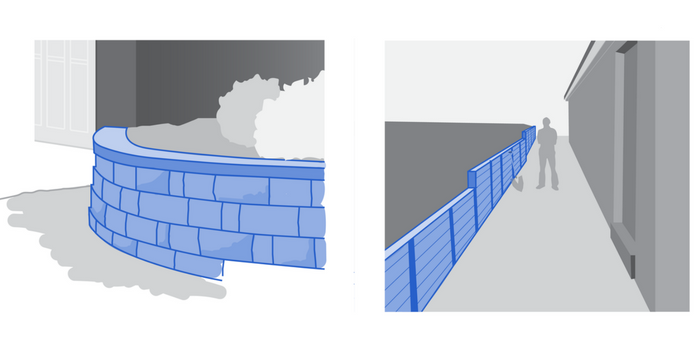 Refer to the height measurements of the retaining wall. Is the height of the retaining wall for excavation 400mm or less? If no, check whether the wall is adequately set back from property boundaries. A wall that supports excavation must be more than 400mm away from other structures and buildings. Is the wall more than 400mm away from other structures? If yes, you do not need a Building Permit. As long as there are no planning restrictions you can proceed to construct the wall. You can now exit this guide. If the surveyor advises that the wall is too close to other structures, apply for a Building Permit. If the surveyor advises that the distance is adequate, and there are no planning restrictions, you may exit the guide and proceed with construction. Lodge the Building Permit application form, fee and supporting documents with Council. For fee information, email Building Services. Building Permit applications are assessed within 10 business days. The response is usually a request for further information that is required before a Building Permit can be issued.